E02 Whatever Happened to Mr. Garibaldi? 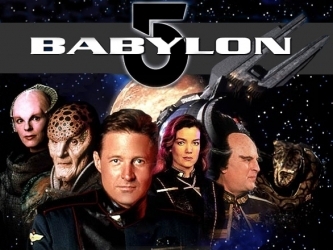 Babylon 5, a Nineties Space Opera created by J. Michael Straczynski, ran from 1994-1998 (a two-hour pilot, "The Gathering", had aired in 1993). It was syndicated as apart of the PTEN network package for its first four seasons, and was shown on TNT in its fifth. While the series is often given as an early example of a hard science fiction show, it does have aliens with powers verging on magic and humans with Psychic Powers. Still, by TV standards, it's fairly crispy sci-fi. Likewise, while the show is often seen as being more toward the cynical end of the Sliding Scale of Idealism Versus Cynicism, at times almost edging into Black and Grey Morality, it also has some shining moments of idealism as well. One could say that the overarching Aesop of the series is "the pragmatic survive, and the determined thrive, but Faith Manages." Thirdspace -- 1998, takes place during the fourth season of the series, after the heroes win the Shadow War and all the First Ones leave the galaxy, but before the beginning of the war to liberate Earth. The River of Souls -- 1998, takes place shortly after the end of series (excluding its Distant Finale). Features Martin Sheen. A Call to Arms -- 1999, takes place about five years after the end of the series (excluding its Distant Finale). Serves as a lead-in to Crusade. The Legend of the Rangers: To Live and Die in Starlight -- 2002 Made for TV Movie telling the story of a Ranger ship. This was actually intended to lead into a third B5 series, but it didn't pan out due to the movie airing at the same time as the NFL Divisional Championship. The Lost Tales: Voices in the Dark -- 2007 Direct to Video Interquel which was intended to be the first of a series of new DTV stories. It didn't pan out either despite some degree of commercial success. It is available via Netflix, on disc only. The WB has also put up Season 1 and the first few of season 2 for online watching. Has an in-progress Recap page. It spun off the short-lived series Crusade, which ran for 13 episodes in 1999, telling the story of the spaceship Excalibur and the search for a counteragent to/cure for a slow-acting biological weapon that had been successfully deployed against the Earth by agents of the Shadows. The series had serious trouble: superficial resemblance to the plot of Star Blazers was cited, and creators commented on the ridiculous amounts of Executive Meddling that they had to fight against. This trend for intervention was attacked more than once in the Crusade scripts themselves. Opinions on the quality of the episodes were divided: to some, the series showed considerable promise before its premature death; to others, markedly less. The Babylon Project Tabletop RPG (with its own 2d6 system). Babylon 5: I've Found Her - a free computer game on the engine of Homeplanet . The Babylon Project - mod for FreeSpace 2. Babylon 5 Universe mod for Vega Strike (on hiatus, probably until the engine overhaul). All Love Is Unrequited: "Rising Star", courtesy of Ivanova (of course). Nothing Is the Same Anymore: "Chrysalis", in the final line of that Season. Touched by Vorlons: "The Wheel of Fire"
Voice of the Resistance: "Death Incarnate"
This page was last edited on 10 October 2017, at 17:03.